On its first sol on the red planet, the mission sent home images of a dusty landscape, a lander selfie, and a wide shot of Mars from space. NASA’s InSight lander takes its first selfie on November 26, 2018. Image: NASA/JPL-Caltech. Shortly after it successfully touched down on Mars on Monday, NASA’s InSight lander took a selfie showing off its new home in the Elysium Planitia region. The picture was taken by the mission’s Instrument Deployment Camera (IDC), mounted on the lander’s robotic arm, and captures the upper deck of InSight’s instrument package, against a backdrop of flat Martian terrain. 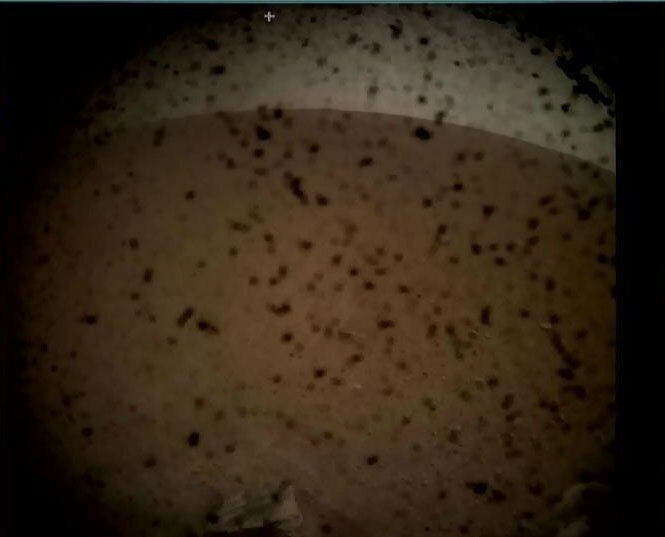 Though it was InSight’s first selfie on the red planet, it was not the first picture the lander sent back to Earth. Just minutes after its nail-biting touchdown, InSight sent a quick landscape shot home to the mission control team at NASA’s Jet Propulsion Laboratory. This image was taken with the Instrument Context Camera (ICC), which is attached directly to the lander’s deck and provides a wide-angle fisheye view of the landscape. The ICC lens is speckled with dust kicked up by the retrorockets that guided the craft safely down to its landing site. But the lander wasn’t the only mission component busy snapping exhilarating new pictures of Mars. 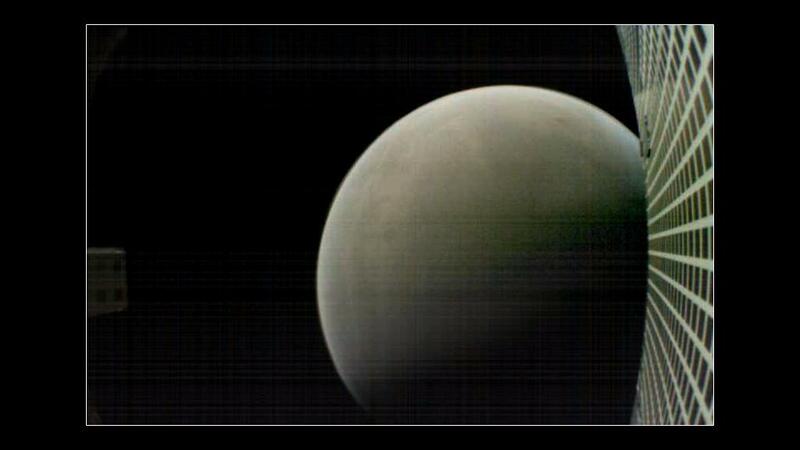 Perhaps the most groundbreaking snapshot came from MarCO-B, a trailblazing satellite that imaged Mars during its flyby at a distance of about 3,700 miles (6,000 kilometers). MarCO-B, along with its twin MarCO-A—nicknamed “Wall-E” and “EVE” respectively—are both CubeSats, a class of miniaturized cubic satellite introduced to reduce the cost of spaceflight. Hundreds of CubeSats have been deployed in low Earth orbit, but the MarCO satellites are the first to voyage into deep space. The CubeSats are about the size of a shoebox, and were launched with the InSight lander back in May, before separating from the main spacecraft to pursue their own trajectories to Mars. Just a few days into the trip, MarCO-B took this picture of Earth with its wide field camera. The MarCO satellites were not essential for the mission, and were bundled into InSight to test out CubeSat performance in deep space. Their successful communications performance and the dazzling shots bode well for the use of CubeSats in interplanetary missions. Given how many fascinating visuals InSight has sent home on its very first sol on Mars, it seems like the mission is already paying off. No doubt the lander will produce many more stunning pictures—not to mention tantalizing data about Mars’ interior—in the years to come.